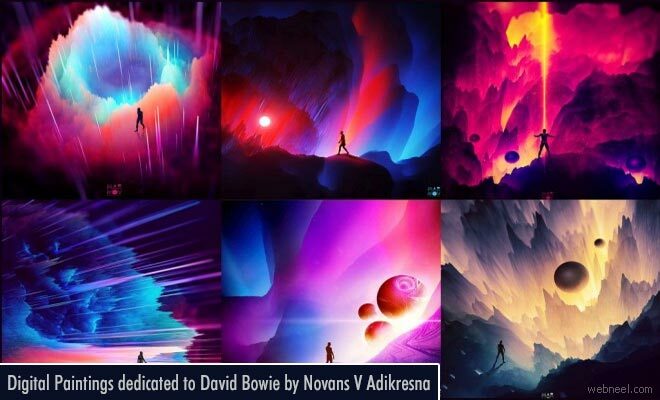 Digital Paintings : The most acclaimed music artist for more than five decades David Bowie's musical journey is portraiyed digitaly by Novans V Adikresna. Novans is a digital artist based in Surabaya, Indonesia. He is Brand ambassadors at Plotagraph Pro Software. The innovative dedication of Novans to the music legend has brought life to the fascinated song, 'Starman' where the lyrics goes this way, There's a starman waiting in the sky. As a tribute to honour David Bowie, Novans created a series full of fantasy and cosmic elements merging together to evolve a stunning atmosphere. Profesionaly he is mainly focusing on digital paintings, direction and retouching.